Photograph of the Jai Mandir inside Amber Palace taken sometime in the 1880s and attributed, probably incorrectly, to Henry Hardy Cole. 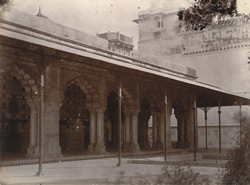 The Jai Mandir was the lower portion of a two-storey 'shish mahal' or glass palace in the private residential area for the male members of the royal family and court. The surfaces of the interior walls are decorated with glass mosaic and inlays in vase and floral motifs. This photograph shows the southern section of the screen of arches in front of the Jai Mandir and some fo the detials of the elaborate inlaid and mosaic work on the walls may just ben seen through the colonnaded archway. The fort at Amber was begun by Raja Man Singh (r. 1592-1615), however this section was constructed later by Mirza Raja Jai Singh I (r. 1623-67/8) as part of later additions to the palace area. The fort was finally abandoned in 1727.